Lamborghini released a video on Wednesday of its new Huracán Performante setting a claimed new production car record at the famed Nürburgring circuit. It’s only been two days, but critics on the internet are questioning whether or not the car actually set the time that Lamborghini said that it did. Here’s what’s going on. Notable skepticism over the Performante’s lap time comes from Nürburgring resident, Jalopnik contributor and race car driver Dale Lomas over at his personal blog Bridge to Gantry, as well as YouTuber Misha Charoudin. Why do I think they’re GPS based? Simple both videos display ‘glitches’ in the speed readout shown on the post-processed ‘dashboard’. These glitches range from barely noticeable to somewhat striking. GPS speed measuring from modern equipment is mighty impressive, but it still falls victim to trees, radio interference and ground reflections. If the post-processed digital dashboards were being fed by wheelspeed sensors (as per usual for a dashboard display) the inherent inaccuracy of measuring a groundspeed using a wheel that changes diameter with speed, temeperature and deflection, would register the following errors almost totally ‘within tolerance’. Because the main camera in the Performante is mounted on the nose of the car rather than behind the driver, it is indeed harder to tell what the car’s tachometer and speedometer reads. We have reached out to Lamborghini to determine how the speedo was fed and will update if we hear back. After measuring the speed of the two cars over the distance from the gantry to the bridge (which is almost exactly one mile), Lomas finds that while the Performante video reported a much slower speed, its split time was only marginally slower than the Aventador SV’s. In his video, Charoudin compares the times of the Performante and the 918. Taking a look at the 918's record lap video and the Performante’s, he measures the highest top speed and the lowest corner exit speed of a section of track. He makes a chart. Here’s a screenshot of it. Charoudin points out that while this could just be a small glitch, but there have been cases in the past where manufacturers report lap times that have been sutured together from the fastest parts of multiple laps. To get another perspective, I asked Jalopnik’s tame racing driver and Nürburgring expert Robb Holland what he thinks, and he said he also feels like there’s something fishy about the lap—though he admitted that it would be difficult to definitively say whether or not Lamborghini cheated. Things like what tires the Performante was using, the roll cage and whether or not it was set up for the Nürburgring. He also pointed out that we don’t know what the track conditions were. The easiest way to help settle things—though not the only way—would be for manufacturers to post their lap data publicly. That way, people could compare it to the times claimed in the video. Even Top Gear presenter and friend of Jalopnik Chris Harris weighed in, but he’s doubtful that there’s anything malicious going on here. Holland doesn’t seem to think so. “This was a manufacturer effort,” he said. It’s highly unlikely that Lamborghini would still make a claim like this even if it suffered some technical difficulties. 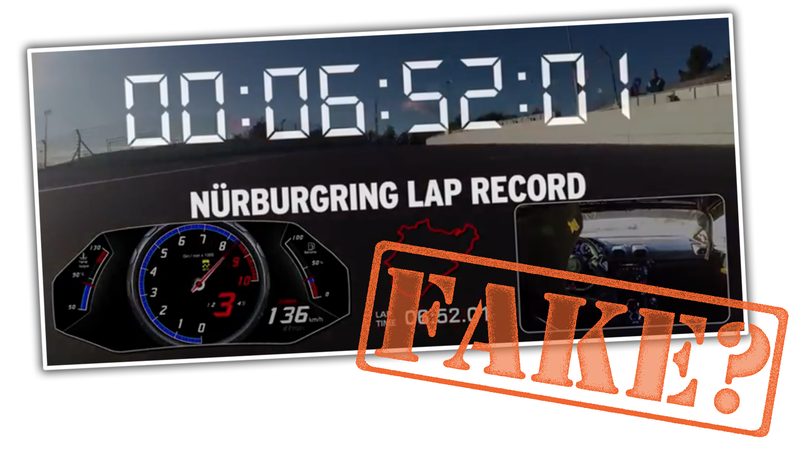 You’d want that hard evidence airtight before publishing it, and at this point, a fake lap time would do it more harm than good. You can read the Bridge to Gantry story and watch Charoudin’s video by clicking on the blue words. The Pirelli P Zero Trofeo R tires, in 245/30ZR20 at the front and 305/30ZR20 at the back were designed specifically by Pirelli’s engineers for the record attempt. We’ve reached out to Pirelli to determine whether those tires are standard on the production car or not. If you know anything about this lap, please email us at tips@jalopnik.com.